There’s no time like the New Year to tackle a new approach to managing your business, especially when it comes to customer service. Here’s how you can take a new approach to customer service this year. 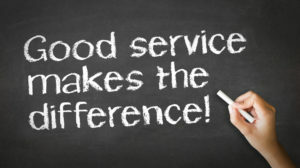 You may think you’re doing the best you can with your customer service, but until you’re on the receiving end of the service treatment, you won’t fully understand or appreciate what your customers experience. Try calling your own customer service line and see how long it takes to get through, or email your customer service department from a family member’s email address. Are you happy with how long it takes to get a response? If not, neither are your customers. Customers who feel like they’re a part of a company’s culture are more likely to become loyal customers. Get your customers involved in things like choosing logos, planning local events, and even playing ‘games’ online. The more involved your customers are with your business, the more they’ll see how they belong. Social media can be a great way to make your customers feel like a part of your ‘family.’ Ask them to share memories of their interactions with your business, or photos of their hobbies and pets. Get personal–customers crave that type of interaction with businesses. Sometimes, your customer complains for no valid reason, at least, not one that you can understand. Teach your CSRs to focus on being kind to all customers, even the ones who just seem to be complaining for no reason. If you can help the customer feel understood or vindicated in some small way, it could change their outlook on your business. Try to approach customer service the the utmost empathy and focus on how you can bring more kindness into the world. Customer service doesn’t have to be serious all the time. Make sure you’re having fun with your customers and your employees. Lighten things up with games and idle chats every once in a while. You may brighten someone’s day more than you realize. If you’re considering using call centre services to boost your customer service, call Answer 365 today.